Shop for beautiful Yorkshire Dales inspired calendars, cards, jigsaws, shopping bags, books, wildflower seed and other gifts, and give something back to the Yorkshire Dales too. A sturdy natural canvas bag with long handles, depicting the leaves of some of our native trees. Perfect for carrying your shopping. This handy ‘week to view’ 2019 diary will help you keep organised all year long. The cover features a beautiful view from Embsay Crag. A hardshell case for your specs featuring a colourful image of a Swaledale meadow. It comes with a matching cleaning cloth and soft lining to protect your glasses. Case measures approx. 16cm x 6cm x 4cm. early medieval farmstead is the last bit of the jigsaw in a ten-year research project around Ingleborough. 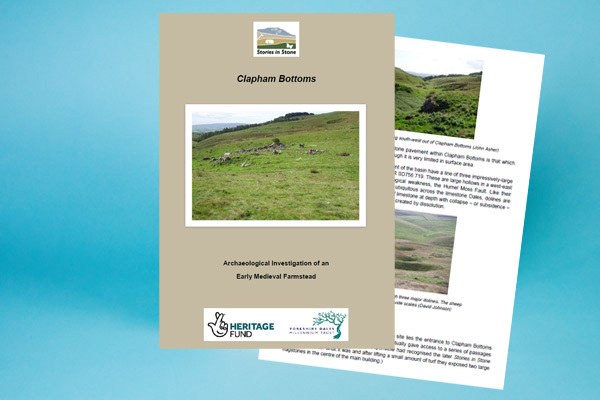 This report details the work of volunteers to excavate a small site at Clapham Bottoms, and findings that are out of all proportion to its hitherto perceived importance. Greetings cards featuring 4 different Yorkshire Dales scenes, including Gayle, Whernside, Kilnsey and hay meadows at Thornton Rust. Left blank inside, these cards are suitable for any occasion. Packs contain 8 cards with envelopes - 2 of each design. Cards measure 15.5cm x 15.5cm. This 1000 piece jigsaw includes colourful images from across the Yorkshire Dales; young lambs, Muker meadows, a Lapwing, an erratic at Norber and a superb Dales view. Introducing our new 1000 piece jigsaw. Includes beautiful images of Muker meadows, a Buff-tailed bumblebee on melancholy thistle, a Green-veined butterfly of valerian, a meadow sward and green hay harvesting. This beautifully written and illustrated hardback book (265 pages) presents ground breaking research in an accessible, readable manner which will appeal to both visitors and local people alike. 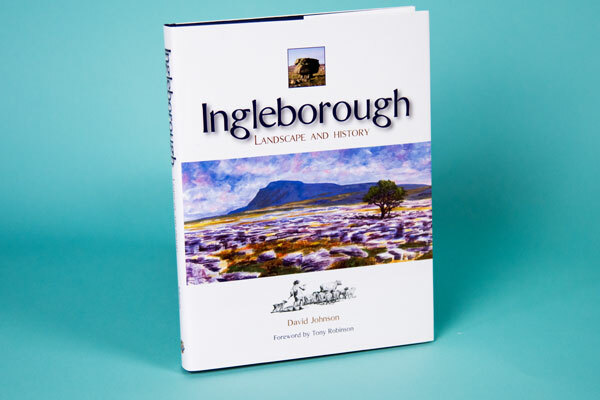 This book documents the fortunes of Ingleborough’s breeding birds, along with records of migrant birds, over the last two decades. There is a good range of species to be found, including some rarities for the lucky observer. Soft-back, 66 pages. 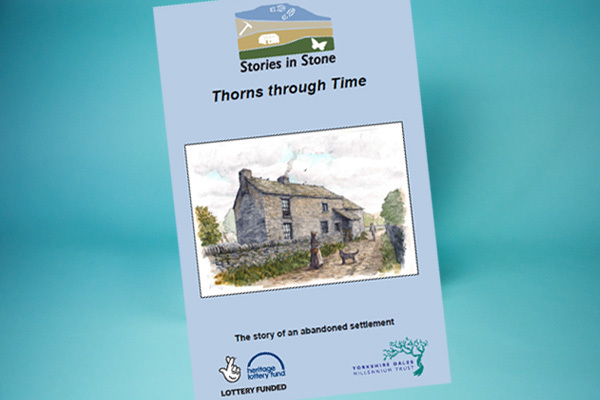 This 300-page report tells the fascinating story of the abandoned settlement of Thorns, near Ribblehead, revealed by archaeological investigations. The depth and breadth of the work marks this out as possibly the most comprehensive project of its kind in the Yorkshire Dales National Park. A soft-back book (102 pages) summarising survey results gathered for 204 bird species recorded by volunteers in the Long Preston area over the last 50 years. This publication also considers the achievements of the Long Preston Floodplain Project, and specifically the benefits brought to birds. Compiled and illustrated by Janet Rawlins. Whilst restoring the library in her husband's family home in Wensleydale, Janet came across a diary by Silvanus Thompson recounting an excursion by five botanists into Teesdale in 1844. Their story includes rivalry and romance as they walk part of the Pennine Way. A truly beautiful collection of detailed watercolour illustrations of Wensleydale's wildflowers, together with locally inspired landscapes and collages for which local artist Janet Rawlins is renowned. Hardback, 188 pages. A 270 page, beautifully illustrated, softback book celebrating the hay meadows of the Yorkshire Dales. With expert insight into the natural, cultural and land management history of the Dales hay meadows, foreword by John Craven OBE and contributions from farmers, authors like Bill Mitchell MBE and academics. One in five British wildflower species are threatened. You can help wildflowers and wildlife by creating a wildflower lawn that pollinating insects will love. This seed has been sustainably sourced from meadows across northern England. PLEASE NOTE - we cannot post seeds to destinations outside the UK. This great little guide will help you identify the flowers and grasses found in the Yorkshire Dales Hay meadows. It is A5 size and is finished with a protective waterproof surface. Perfect to take on your next walk in the Dales. 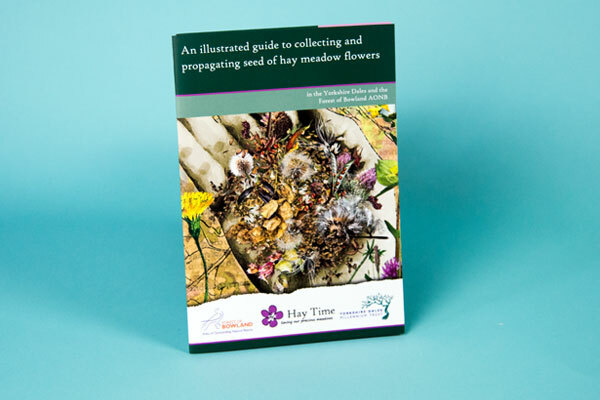 An illustrated guide to collecting and propagating the seed of hay meadow flowers in the Yorkshire Dales. It is folded to A5 size and is finished with a protective waterproof coating - perfect to take on your next walk in the Dales! The 2018 CD album by The Moonbeams – a contemporary folk band based in Long Preston who play original songs of life, love and nature reflecting the culture and landscapes of the beautiful Yorkshire Dales. The 2015 CD album by The Moonbeams – local musicians who play original folk-based music reflecting their love of the landscapes and life of the Yorkshire Dales. A collection of poetry by Isobel Thrilling. Isobel has won many poetry prizes and has had her work broadcast on television and radio. Featuring black and white photographs by Ian Thrilling.